When you’ve got a really long wall or maybe just a tight space to measure, a measuring tape just isn’t going to cut it. That’s where one of those nifty little laser measuring tools comes in. You can use laser measures for almost any project. I’ve personally used them to measure longer walls for crown molding and even rough window openings for ordering new windows. A good laser measuring tool is pretty much a Godsend in the finish carpentry business, especially when measuring walls for crown molding. How do you know which laser measuring tool is the best with all of the options that are available? That’s where our experts come in. They’ve researched and reviewed all kinds and brands of laser measuring tools for you. A thin measuring tool designed to fit in the pocket, and 1/8th inch accuracy up to 100 feet. Will switch between metric and imperial units, and it contains an integrated 4V lithium battery. While that might be annoying for some, it does allow the box to be charged with a USB port, so even if you forget to charge it up the night before you need it, you can plug it in on the way to the jobsite. 2000 measurements per charge, so no worry about running out of battery life. It comes with charging cable, but you will have to provide your own USB wall plug if you don’t have one. The port is the same as an Android adapter. Don’t get it wet, and try not to use it at less than a foot distance, since the short range throws the measurement off a bit. Measures distances out to over 300 feet. This is a solid little unit for everything from light surveying to interior measurements. The small form factor measures 1.2x2x4.5 inches, so it’s a pocket-able device that you can take just about anywhere. The anti-skid design makes it simple to keep it in place while tapping the button, and the screen is bright. It isn’t waterproof, so keep that in mind if you are using it outside. Measurement accuracy is rated to 1.5mm, so it’s pretty precise, and it runs off of 2 AAA batteries (not included). It even has a 3 minute automatic off in case you forget to disable it before dropping it in a pocket. Of course, that could be a little annoying if you are using it at long distances by yourself. It’s a solid unit, and it’s accurate. Oh and have you checked the price? If you are looking solely for a tape measure replacement, then this might be right up your alley. This is Bosch’s lightweight, easy to use laser device that will measure up to 35 feet with 1/8 of an inch accuracy, suitable for most smaller jobs. It runs on 2 AAA batteries and will operate in a wide range of temperatures, from 14 degrees Fahrenheit to 104 degrees, which covers most environments you would be working in. No frills or fancy gimmicks, just a simple laser measure that works. It gets some pretty awesome user reviews on Amazon. If you came here looking for top of the line, you found it. Two laser measures so you can get the standard 165 foot model, or the 330 foot version. While costing a bit more, these are highly accurate devices. The 165 footer measures down to 1/16th of an inch, while the 330 will measure all the way down to 1/32nd. A two or three line, back-lit display (depending on the model) provides an easy to read surface on both models, and they will both perform volume measurements and and some calculations, along with storing measurements in memory. The designs are water and dust resistant, rated IP65, so you can use them outside without worry. It runs off of 2 AAA batteries, which are included in the box. To put it shortly, if you need a professional laser measure for work, then you should take a serious look into these DeWALT measures. If you are just looking for something cheap and easy, then it probably isn’t the laser for you. If you’ve read some of our other reviews, then you know that we LOVE DeWalt on Wood Tools Guide and this laser measure is a great example a fine DeWalt tool. The Bosch compact blaze laser distance measure, 65-feet GLM 20 features a long-range measuring with extreme accuracy and measures distances up to 65-feet to with 1/8 inch. You can measure in meters, feet/inches or only in inches. It is easy to use with its simple, one-button operation. You only need to press the button once to start measuring. The GLM 20 is small enough to fit in any pocket. It provides default real-time measurement and as you move closer and farther from the target it adjusts like a tape measure. It features a backlit display that makes it easy to read measurements even if it is dark in the area you are in. You are going to be much more productive with greater accuracy and precision. This Aikotoo laser measure is a mid-range distance measure and can calculate distances up to 130 feet (40 meters) with an accuracy that isn’t off more than 2mm in either direction. You are able to measure the accuracy easily by simply pointing the laser distance measuring devices dot at a target like a wall, house, pole or almost any other object and the device is going to show the distance on its LCD screen. You only need to cycle through the units until you get to the units of measure you want to read the measurements in. The laser measurement system is protected from the elements by a durable fiberglass and casing that is solid to make sure the measurements remain accurate at all times. The laser meter is protected from total dust ingress as well. There is a multifunction measurement as the laser measures distance, length, area and volume and has a continuous measurement tracking. You also have addition and subtraction and it displays measurements in standard, decimal, metric or fractional units. You get two 1.5V AAA batteries. You have a LCD screen and mute mode as well. The Tacklife HD40 classic laser measure has great accuracy with the two bubble levels providing more precise measurement when compared to only having one bubble. Its measuring range is up to 131 feet to meet your regular measuring need. You can hold the U button two seconds to switch the unit among meters, inches and feet freely. You can have handy and compact mode to provide good operation feeling. The supplied durable carrying pouch keeps the laser meter off dust. You can easily carry and hold it everywhere. The large LCD with back light supports better visibility in low-light conditions. When it comes to function, it automatically calculates area and volume, has 30 groups data memory, you are able to manually delete data and more. You can easily and quickly measure with this laser measure. This Tacklife advanced laser measure has high accuracy with its laser precision technology of only being off 1/16inch and measuring distance extends to 131 feet. You can switch it from meters, inches or feet for free adjustment. The LCD backlight allows you to see easily in dark areas and mute settings allow you to turn off and on the measure beep as you would like it to be so you can even use it in the library, classroom or other places you need to be quiet. There are many measurement features that you can use including area, distance, volume and more. It is durable and handy with IP54 waterproof level and dust-proof function to protect the laser distance measure to the maximum extent. There is a 24 month warranty so buy knowing you’re in good hands. 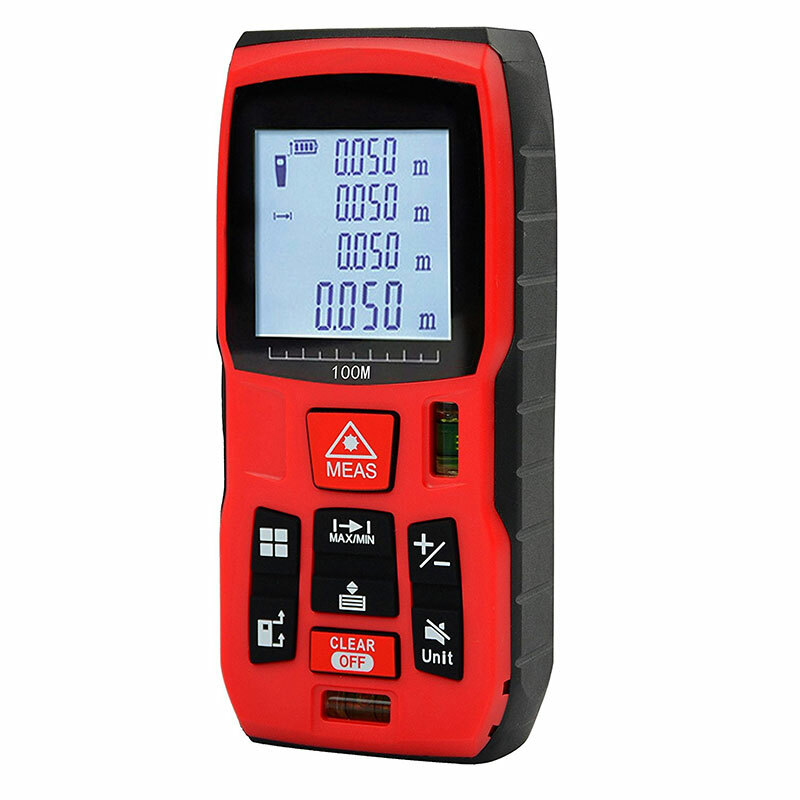 What’s The Best Laser Measure for Me? We’ve given you a lot of solid options above, but ultimately your choice will depend on the size of walls that you need to get a good measurement on. Another consideration is if you’re a pro contractor or if you’re a DIY weekend warrior. That will decide how much you want to spend on a laser measuring tool and how long you need it to last (name brand vs. off brand).